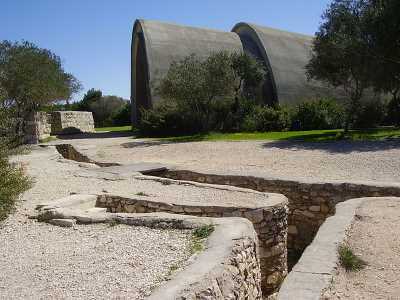 Ammunition Hill, scene of a vital Six-Day War battle, is one of Jerusalem's most moving sites. Unfortunately, it is often overlooked by tourists. Perhaps the raw intensity of the place scares some people off — but it is also what makes a visit here unforgettable. The scene of a brutal, legendary battle in 1967, it has become a modern Israeli symbol of heroism under fire. It is where the main induction ceremony for Israeli paratroopers takes place, and is also the inspiration for one of the most famous Israeli songs about the Six-Day War, Givat Hatachmoshet. 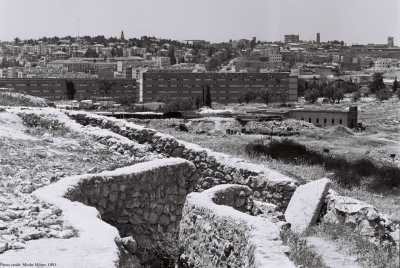 The fortified trenches built by the Jordanians facing a Jewish neighborhood in Jerusalem. Built by the British in the 1930s, the site was used to store ammunition and was connected to a nearby police station by a series of trenches. The Jordanians seized control of the hill when the British left in 1948, cutting off the Israeli enclave on Mount Scopus from the rest of Jerusalem. Because the hill provides a 360-degree view of Jerusalem below it, it was absolutely vital to the Israelis during the Six-Day War in 1967 to capture it. The battle took place on June 5th and lasted four and half hours. The Israelis had expected only half as many Jordanian soldiers to be stationed there as there really were. It was a bitter conflict, involving hand-to-hand combat through the trenches before the battle was won. Over a hundred soldiers fell: 36 Israelis and 71 Jordanians. 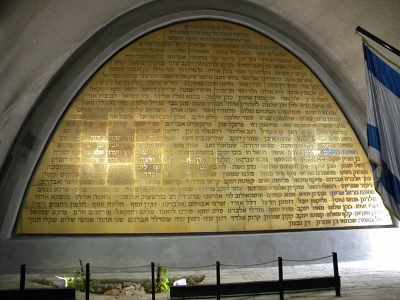 The memorial wall commemorating the fallen soldiers. Udi Steinwell, cc-by-2.5. The site has been preserved as a memorial and museum. Visitors can walk through the trenches, climb old tanks, view a video about the battle, pay their respects at the memorial wall. There's a shady picnic area, where you can dine next to real tanks. And intrepid souls who want to experience fear over the battlefield can also sail over the trenches on a zip-line or do some bungee jumping. People still debate the appropriateness of the zip-line and bungee jumping at what is a somber, important site, but there's no denying that the extreme activities have been drawing younger crowds that might not have come to learn about what happened here otherwise. Where: 5 Zalman Shragai St. Hours: Sun - Thurs. 9:00 a.m. to 17:00 p.m.; Friday, 9:00 a.m. to 13:00 p.m.